Having just posted threats to the Huntington Theatre Company in severing ties with Boston University now the other shoe has dropped. Emerson College, in recent years a major presence in the Boston theatre district, as a part of its expansion bought the historic Colonial Theatre on Boylston Street. The performing arts based college manages the Majestic Theatre. The venerable Colonial thrived during an era of out-of-town tryouts for Broadway bound productions. The most successful of these shows returned to Boston during regional tours. Only the latter part of that formula remains with ever more attrition. For colleges with production facilities the diminishing bottom line and high costs of maintaining vintage facilities has resulted in a growing sense of liability. Only so many old houses can be maintained. After remaining dark for many years a languishing vaudeville house, The Modern Theatre on Washington Street, was purchased and is programmed by Suffolk University. In an e mail blast we compared and contrasted the alliance of the Huntington and Harvard vs. American Repertory Theatre and Harvard. I reported that BU has an active theatre program while Harvard does not. Under former artistic director Robert Brustein A.R.T. was known for cutting edge theatre that was often hit and miss with audiences. That policy was continued under Robert Woodruff from 2002 to 2007. By then Harvard was losing money and considered shutting down the equity theatre to focus on academic programming. Under Diane Paulus A.R.T. has bounced back with award winning programs more populist than avant-garde. That has resulted in a high percentage of ticket sales as well as accusations that A.R.T. has evolved into a commercial house abandoning the bona fides of the high art Brustein/ Woodruff legacy. Increasingly, universities have focused on the bottom line when asked to sustain and subsidize arts programming. In a controversial speech the former head of the National Endowment for the Arts, Rocco Landesman, suggested that there are more arts facilities and programs than communities are capable of sustaining. In a Darwinian prognosis he proposed that it is better for a city to have three thriving theatre companies than four struggling ones. While there were strong protests against those remarks as inappropriate for the head of the NEA the kind of nip and tuck that is occurring confirm that his observations were mostly on target. Here in the Berkshires the musical chairs of four theatre companies begs questions about what happens when the music stops. Too many companies and arts organizations are tapping into a limited pool of donors. In a consolidation emerging as Berkshire Theatre Group, the former Berkshire Theatre Festival in Stockbridge took on what many see as a white elephant, the magnificently restored, but difficut to program Colonial Theatre. It is dark too many nights including during the busy summer season. The financial challenges of Shakespeare & Company have been widely reported. Within a year it fired one artistic director, Tony Simotes, and had another one, Rick Dildine, quickly resign. It is presently being run by committee. On the plus side The Mount, reported on the brink of extinction a few years ago, has now paid off its debt. Like the Huntington and A.R.T., The Williamstown Theatre Festival has a summer program in agreement with an academic institution, Williams College. Overall, W.T.F. is prospering with a solid endowment and strong ticket sales. Going back to the administration of the recently deceased Roger Reese, and before him, the company was faltering. W.T.F. got back on track with the late Nicholas Martin, followed by Jenny Gersten, and this past season under Mandy Greenfield. This past season programmed by Greenfield saw a parade of stars in the Berkshires, but unlike the administrations of Martin and Gersten, nothing from the past summer is moving on to New York. The best bet was Moon for the Misbegotten but it received a negative review from the New York Times. Below is an e mail circulated regarding the Colonial Theatre. 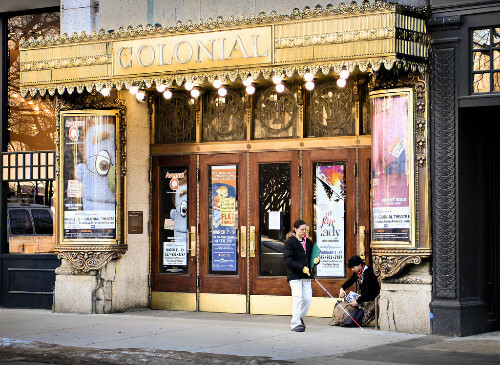 The Boston Globe reported that Emerson College, owner of the historic Colonial Theatre, is drawing up plans to convert the theater into a student center. Consequently, many have expressed concern about the impact that proposed changes may have on the 115-year old space. The Boston Preservation Alliance has met with Emerson College to better understand the college's rationale for the changes they are considering for the Colonial, and to make certain the College recognizes the significance of this historic space to the city. Emerson seeks a solution that maintains the theatre's historic integrity and provides increased access and visibility to this unique space. It is hoped that the college will engage in full public dialog, as plans are still in the preliminary phase of development and Emerson reports that the concept discussed in the Globe is just one option under consideration. The Alliance plans to continue a close involvement. There is a long history of working with Emerson on their historic properties, including the Paramount Theatre and the Little Building. As they continue to develop a plan for the Colonial it is hoped that that preserves its remarkable history and reanimates the performance space within the facility, as noted by President Lee Pelton in a letter to the community where he clearly notes preservation as a top priority.